After the Bacon Vodka Infusion experiments two more Bacon-y goodness ideas have floated through the intra-web to me. 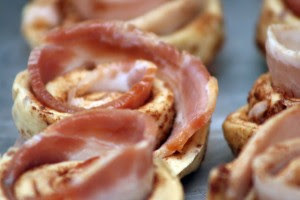 First on tap (as it's slightly easier and quicker to bake in my minuscule toaster oven) are Bacon Today's Bacon Cinnamon Rolls. These things look incredible and very easy to make. It's that perfect combination of salty and sweet much like Vosges's Mo's Bacon Bar. Will post my pictures and results when I get around to it... maybe a Coachella morning snack perhaps? And also on the list... but procrastination might get the better of me on this one... 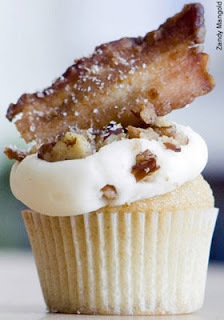 Maple Bacon Cupcakes. Intern Malcolm brought these to my attention, citing Yummy Cupcake as the source of these incredible creations, yet sadly they're not on the April menu so I'll have to make some myself. It's the same salty/sweet combo, but the thought of infusing maple-y syrup goodness and pancake essence into these make them the perfect balance of breakfast and Satan.